360 Degrees VR Digital content. Heineken is one of the most sustainable Beer brand in the world. From energy innovations to inspiring positive social change. Heineken is considerably reducing water consumption in breweries and plan to cut consumption by 30% by 2020. Heineken is also starting to look beyond 2020 to define 2030 commitments in alignment with the COP21 Paris Agreement on climate change and the UN Sustainable Development Goals. 360 Agency Berlin filmed for Heineken a 360 degrees Digital Content where the viewer can maneuver between the different atmosphere of the set. Producer: 360 Agency Berlin, Director: Andrea Henao, DOP: Ramses Radi, DOP: Jackie Mia, Sound Engineer: Alexander Olenga, Sound Engineer: Pablo Saitua, Stylist/Make Up Artist: Marie Klinke. 360 Agency Berlin worked on the strategy, the creative development and post production - Mars 2017- Launch Campaign across 17 different TV channels and 11 destinations. 290 millions cars in Europe, spend 93% of their time parked. In this current conjuncture of mass production and wastage, and, with the raise of shareability economy, Drivy developped a very clever particular to particular car rental service. Drivy is the leader in France and shall keep this leading position in other European markets . 360 Agency Berlin, created the taglines for the German market and adapted the content to this target audience, providing services from Copy writing to post production and TV Uploads. TV campaign across 17 Channels, 11 destinations - Mars 2017. Project Manager: Alexander Olenga Copy Writer: Christian Herde and Martin Gosch, Creative Direction Ramses Radi, Post Production: Humphrey G. Lebrun. Hernest creates a new world of sleepwear we've all been dreaming of. Soulful attention to detail, luxurious, and ageless style - with a conscientious, ecological. The brand uses TENCEL material in all their garments. Lyocell fibres have gained a commendable reputation for their environmentally responsible closed loop production process. Also 100% of their packaging (including hang tags, labels, bags and shipping materials) are reusable, or made from recycled material and is recyclable. "PANDORA is committed to advancing responsible business practices from the sourcing of gemstones, high-quality metals and other materials to the crafting and marketing of the jewelry. PANDORA, have strict ethical requirements of their business partners. This means that their crafting facilities in Thailand, as well as relevant suppliers and subcontractors are subject to audits and approvals by these partners before a final business contract can be signed, and are subject to frequent audits hereafter. Photographer and Art Director Ramses Radi. Luxoft is creating the future of the automotive industry with a project called Berlin 2040, this initiative has for goal to address questions of the future of the industry such as reduction of CO2 emissions, Vehicles sharability, automated conduct) . For this purpose 360 Agency Berlin created a 360 degrees landing page enabling to understand the vision and proposal of Luxoft. For this campaign 360 Agency Berlin has built the strong media strategy, planning and buying across offline and online platforms. An entirely integrated campaign has been built to touch the audience during different points of their consumer journey, hence Digital, outdoor and cinema have been planned together to increase reach and Frequency and enable a consistent message across various but complementary platforms. 360 Agency Berlin worked on building the brand strategy, reviewing the online properties, building the creative development and supporting the post production process - European Launch in September 2016. Do you green is an ecological brand which produces all their underwear from pine tree, which requires less water than coton to be processed. The material is very soft and made in France as well the as the dentelle that they use in their collection. 360 Agency Berlin worked on the strategy, the creative development and media the implementation - September 2016 - Online Campaign. Online campaign seeded in social networks and online display, to support the launch of two new working spaces in Germany. 360 Agency Berlin assets created the creative assets below to seed online. Campaign aired in our Social Media Platform Facebook, Instagram, Linkedin and Twitter. 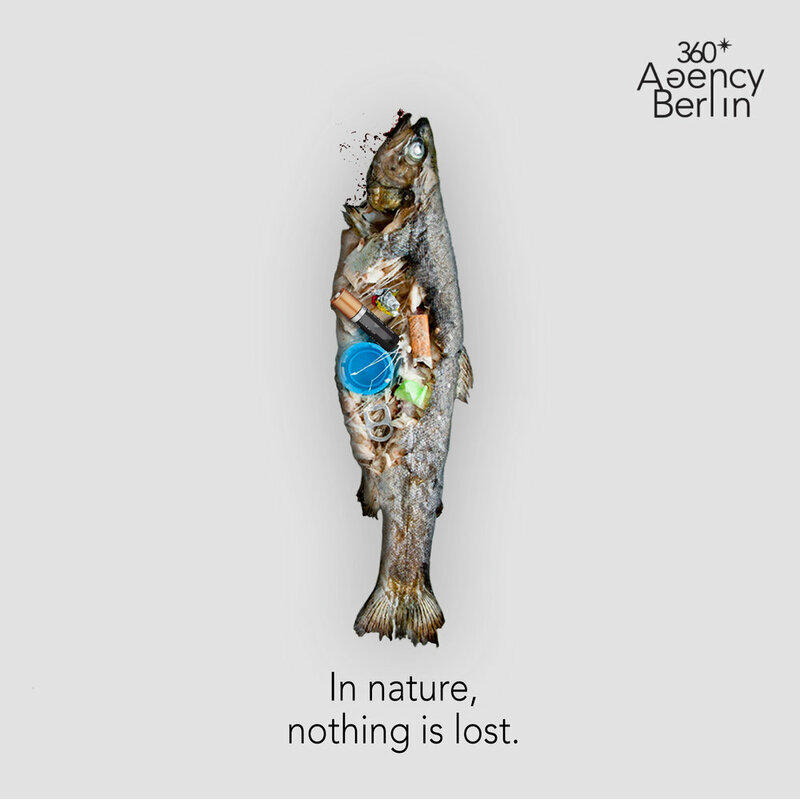 360 Agency Berlin assets were revolted to see the effects of plastic on our marine natural resources, hence the creative team decided to create impactful creative assets in order to incentivise the viewer to avoid wild dumping and increase recycling. This campaign managed to generate 20,000 views on social media entirely organically. 360 Agency Berlin asset Simon B is a great asset when it comes to Animation, 2D and 3D design. He created for 360 Agency Berlin a collection of Key Visuals denunciating in a very colourful way the animals of the planet most in danger. Campaign aired in our Social Media Platform Facebook, Instagram, and Facebook.